From the 1960s, Done Bookmakers was a name that was synonymous with secure betting on the high street. However, in 2004, things ramped up a gear with a name change to Betfred, a full rebrand, and with it the debut of its online incarnation. It was this digital version that, eight years on from its launch, became a lucky bet for one winner. In 2012, a Betfred Casino customer won a life-changing £5.1 million jackpot in just six spins on slots game, Beach Life. The winner was, at the time, the biggest online progressive jackpot winner in UK history and the third biggest ever worldwide. Better still, the winner – whose name has never been revealed – was flown out via private jet to meet Betfred.com founder, Fred Done to be presented with the cheque. While players aren’t likely to hit a jackpot like this every time, they can enjoy playing on a site that has gone the distance. Betfred is a well-known, established brand and if you are player who enjoys the interactive element and flashy extras that come with a big betting name, then this is a site that is well worth trying out. Gameplay is straightforward and you will find everything you could possibly want here. This is online casino gaming for those who want to stick around to try a bit of everything. The Betfred Live Casino Welcome Bonus is an ongoing offer that is designed to draw in those who enjoy playing against a live dealer. This is a straightforward offer that just requires you to opt-in, stake a minimum of £20 on Live Casino over five or more game rounds, and be rewarded with five golden chips worth £1 each on the live blackjack and roulette tables. There’s no wagering requirements on this offer either, so players get to keep all of their winnings. There are plenty of other promotional offers to look out for, and these can be found in the promotions section of the site accompanied by a countdown clock that indicates how long is left on each offer. 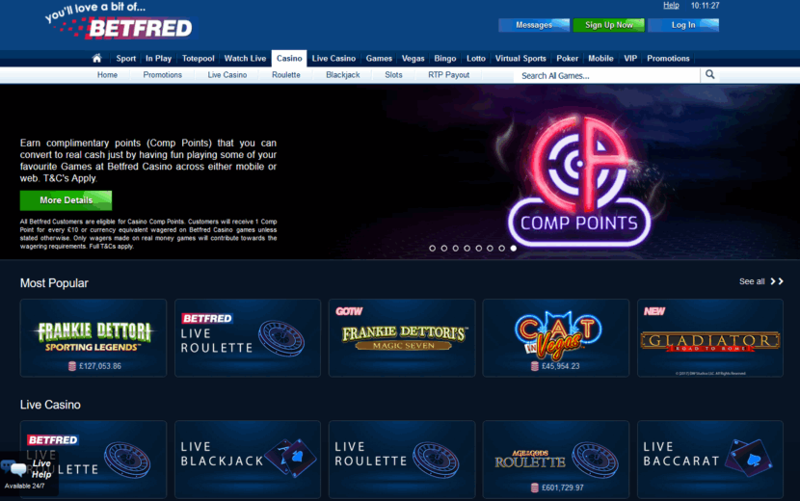 In order to earn more money, Comp Points is the Betfred loyalty programme that can add up to prizes. As you play the different casino games – either on the desktop site or via mobile – you earn loyalty points, called Comp Points. All Betfred Casino players are eligible, and you receive one point for every £10 or currency equivalent wagered on the casino games unless it states otherwise. You can earn double Comp Points when you play the Game of the Week, which can be found on the promotions page. To achieve double points, players need to opt in before playing. 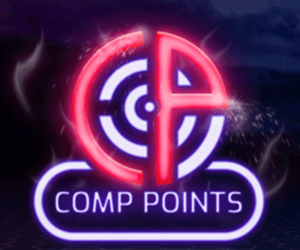 The Comp Points achieved can be converted to real cash and the more you play, the more likely you are to raise your level. The different levels are explained below. It is important to note that only wagers made on real cash money games contribute towards the wagering requirements. See the Betfred website for full details. Base – Requires 100 conversion points for a £1 cash prize. The minimum number of points to convert is 1,000 (£10). Bronze – Requires 95 conversion points for a £1 cash prize. The minimum number of points to convert is 950 (£10). Gold – Requires 85 conversion points for a £1 cash prize. The minimum number of points to convert is 850 (£10). Diamond – Requires 70 conversion points for a £1 cash prize. The minimum number of points to convert is 700 (£10). While this is not as flashy as some of the loyalty schemes that are available at other online casinos, and while there are arguably fewer rewards involved here, this is probably one of the more straightforward systems to follow. There are no elaborate rankings to work out and participants can enjoy their play knowing that every spin or roll of the dice is earning them something towards the points scheme. Ultimately, when looking across the different loyalty programmes out there, this is a simple way to achieve cash prizes. You may have to forfeit the benefits that come from playing the points systems at other online casinos, such as extra support and other goodies, but this is a good way to know where your points are earned. Whether you have won on the slots or you are cashing in your Comp Points, it helps to know how to deposit and withdraw your money, and Betfred accepts a variety of forms of payment. Above you’ll find an at-a-glance guide to the main payment options. If you want to find out more about the different terms and conditions when it comes to banking, head to the Betfred website. Four software providers power the Betfred online casino site: Ash Gaming, IGT WagerWorks, Boss Media, and Playtech. The range of providers makes gameplay diverse, while using big-hitting software name Playtech means players know what they will be getting, thanks to the range of recognisable games. That’s not to say that gaming with Betfred is predictable. The other software providers ensure that you are getting a variety of gaming options and interfaces to work with, meaning that whether you prefer something flashy or something more no-nonsense when you play online casino, all of the options are there. Having said that, when you look in detail at the number of games that are available, you may notice that Betfred seems to have just enough. It hints at the different casino games, so you get a few table games here and a couple of roulette games there. This isn’t necessarily a negative, but if you are a player who wants to have a choice of 30 blackjack titles, you won’t find them at Betfred. To see exact numbers, read on in this section. By using these four different software providers, Betfred can offer you access to around 250 games. All games are in Flash so no software needs to be downloaded to your desktop. If you are playing on the go, there is a download option for a selection of over 200 games that are HTML5-enabled. The download option offers access to exclusive slots as well as special offers, making this one of the more generous downloadable casinos out there. When it comes to live casino, Betfred was one of the first to run games featuring live dealers. However, in recent years the casino has moved away from investing in its live games and today you will notice that it is a straightforward experience. Powered by Playtech, the live games are no frills but there is a comfortably familiar feeling to gameplay that holds its own appeal. Most Popular – This is a quick-look guide to 42 titles that might be of interest. Live Casino – There are five live casino games to play against live dealers, from roulette to baccarat. New Games – Here you will find the latest 10 titles that have recently been added. Roulette – You will find 12 roulette games at Betfred, each offering something different. Try Pinball Roulette for a speedy game, Penny Roulette, or for something a little bit different, have a spin of the wheel on Frankie Dettori’s Jackpot Roulette. Blackjack – Among the seven blackjack titles available, you can choose from Perfect Blackjack, Cashback Blackjack, and Progressive Blackjack. Slots – If slots are your thing, you have 151 titles to try out. Games include Space Invaders, Justice League, Jekyll and Hyde, and Dirty Dancing. Jackpot Games – If you are playing for the big-hitting jackpot games, take your pick from 33 different games. Prize pots run into the multiple millions, and titles such as Jackpot Giant, Beach Life, and Jackpot Bells all pay out for those in search of the big one. Scratch Cards – There are 6 scratch card games in total, including Pink Panther and Rocky. Poker – Poker has been given its own tab at the top of the menu and there is a choice of games that are regularly updated. 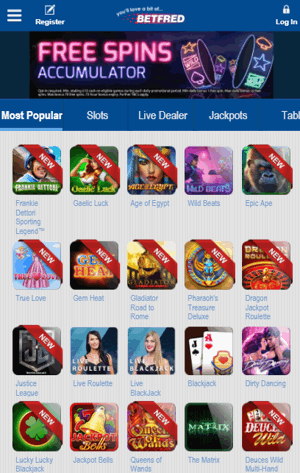 There are a few Betfred apps to choose from that are run by Betfred, however if you want to solely focus on the casino games, there is a dedicated app. At the Betfred mobile casino, you will find over 100 games that have been optimised to work across mobile devices. Therefore, whatever smartphone you have, you will be able to access Betfred’s mobile games and they will run as smoothly as they do on your desktop site – even when you are playing in a space that has a slower Wi-Fi connection. The mobile options reflect the desktop site in that it sets out its stall in a straightforward way. This means that you can easily navigate to the games you want to play without having to trawl through different pages – and this is useful if you have limited access to Wi-Fi while you are out and about. While it is not necessarily the most stylish mobile app, it is functional, and you will find that gameplay is just as effective away from the desktop. There are some boxes being ticked here as well that make this an attractive download. These include being able to play your bonuses and with your existing balance via the app, accept bonuses and meet wagering requirements through the mobile version, and it is possible to play on mobile while abroad. You can deposit and withdraw from your account while on the move, so you can top up whenever you access the app and you can do this in all of the ways that are available on the desktop site. 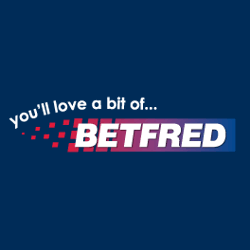 The Betfred brand that we know today has its origins in just one bookmakers shop in Salford. Fred Done and his brother Peter opened Done Bookmakers in 1967, and over the course of the following five decades the pair built their business on sports betting, becoming the world’s largest independent bookmaker and recognisable as sponsors of global sports such as the World Snooker Championships. By the late 1990s, there were 100 shops across Britain and as the year 2000 rolled around, this number of Done Bookmakers shops had doubled to 200 shops. It was only in 2002, however, that the Done brothers saw the opening of the first shop in Greater London, and this coincided with the launch of the phone betting service, allowing people to place bets without having to leave their home. It was the advancement of the internet that paved the way for the bookkeepers and casino we know today. In 2004, Done Bookmakers underwent a full rebrand, becoming Betfred and launching its first website. In fact, 2004 was a good year for Betfred as it made history for being the first betting shop to make a millionaire. By going online, casino play became a lucrative venture and, while the original site was very rudimentary in the early days, it has gone on to become one of the biggest parts of the Betfred business. As time has gone on, the online version has grown to become a continuously evolving thing, meaning that players are getting the very latest version of the digital persona of the Betfred brand. Today, the business is based in Gibraltar with a strong UK team. As of summer 2017, there were over 1,600 shops operating across the UK. In September of the same year a documentary about the history of the company was premiered on the official Betfred YouTube channel as part of its 15th anniversary celebrations. The customer support team at Betfred are friendly and offer their expertise in a straightforward way. They are available over email, post, and local rate numbers, via post (see the address below). There is also a 27/7 instant chat option that is very useful. When having a conversation via instant chat, the questions were answered efficiently. Before getting in touch in these ways though, it is well worth taking a look at the Help page as this offers a lot of answers to questions you may have. Click the ‘Help’ tab at the top of the home page – located at the top right of the home page – to access the customer support options. This will take you to a page filled with the different topics that you may need assistance with. Live chat – this can be accessed using the small link at the bottom left of the screen. Although it is not prominent, it is worth using this if you need the service. Address – Unit 5.2, Waterport Place, 2 Europort Avenue, Gibraltar. License – Betfred has a gambling license provided by the UK Gambling Commission: 39544. The company is registered in Gibraltar with company number 99314.